All our special offers, for caravans and motorhomes, are available to view here. From manager specials to exclusive deals, you can now view them all quickly and easily in one place, ensuring you never miss an offer. View our selection of luxury 2018 Burstner ex-hire motorhomes, available from October 2018. These vehicles have only been used in our hire fleet, so are in excellent condition. They have been serviced, cleaned and cared for to the very highest quality by our team of experienced and knowledgeable staff, so you can be sure buying one of these motorhomes will be money well spent. Due to the huge buying power at Leisure World, we are able to pass on big savings across our new accessories, awning and tent collections. Now is the best time to bag yourself a cracking deal. Plus, we have a big selection of used awnings available, all at clearance prices. All products listed are available whilst stocks last - please call or enquire about availability before travelling! For the 2019 season, Leisure World Group is proud to stock a wide selection of new motorhomes for sale from a selection of trusted and much-loved brands. Available in layouts to suit all lifestyles, find your next new 2019 motorhome at Leisure World Group. With a great range of new models in stock, from leading brands including Auto-Trail, Burstner, Elddis, and Roller Team, you are sure to find the perfect motorhome for all your adventures. Practical and flexible layouts give you the space you need, at prices to suit a variety of budgets. All of our used motorhomes are thoroughly serviced, tested and valeted to ensure they are just as good as new. Take a look at our current range of pre-owned motorhomes to find your next dream leisure vehicle. As part of our part exchange scheme, the vehicles we have taken in will soon be available for your purchase. To register your interest for any of these vehicles, please follow the link below, we will then email you once the vehicle has arrived in stock. Whether you are new to touring and want to see if the lifestyle matches your expectations, or want to enjoy a motorhome holiday without the expense and hassle of owning your own, hiring a motorhome from Leisure World is a cost effective and practical option. Our range of finance options give you the flexibility to pay for your new or used motorhome over a period that suits you. Find out more about the options on offer. Find out more about the motorhomes we have on offer. Don't forget, our friendly staff are always on hand to offer help and advice, and answer any questions you may have. 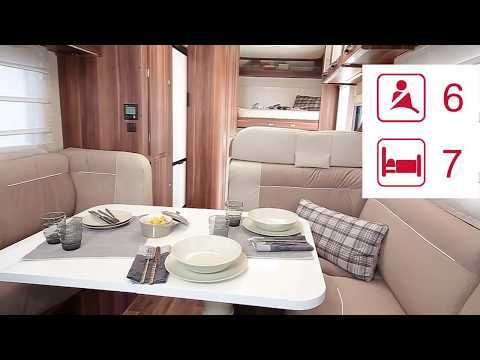 Discover new layouts and stunning designs throughout the selection of new 2019 caravans in stock at Leisure World. With the latest models from well-known brands, you will be sure to find something you love. Our extensive range of new caravans includes all the biggest names in the industry. From the iconic Airstream right through to the tiny Caretta compact caravans and everything in between, you are sure to find the perfect caravan for your lifestyle. Fully serviced and in the excellent condition that we know you expect, a used caravan from Leisure World is a cost-effective way to take your first step into the caravanning lifestyle, or to upgrade your existing leisure vehicle. The Lunar Galaxy range of caravans are exclusive to Leisure World, seven stylish models, packed full of features that would normally only be found on manufacturers' flagship models. Leisure World can offer finance options that give you the flexibility to pay for your caravan in a way that suits you. With both HP and PCP available, your next caravan purchase can be easier than ever. Take a look at our complete caravan towing guide for all you need to know. Including your vehicle’s capacity, speed limits, and practical caravan towing tips. Find out more about the caravans we have on offer. Don't forget, our friendly staff are always on hand to offer help and advice, and answer any questions you may have. There’s a host of reasons to hire a motorhome and even more for why you should hire from us instead of anyone else. Find out more about our hire benefits here. Booking your deluxe motorhome holiday with Go Luxury couldn’t be easier. Simply browse and choose from our list of outstanding Roller Team and Burstner motorhomes, select your dates and give us a few details. All that’s left to do is decide where you will be exploring. As we’re located in the heart of Yorkshire we’ve found loads of great things you could visit when hiring a motorhome from us. Take a look at our places to go page for some inspiration for your motorhome adventures. All of our hire policies can be found quickly and easily here. Before getting out and about in one of our deluxe motorhomes make sure you know the legal bits, so that you can maximise the time you spend enjoying the open road. Before you hire a Go Luxury motorhome it is a requirement to read, understand and agree to our terms and conditions. You can read these in full here. Hiring a motorhome from Go Luxury doesn’t just mean you get the vehicle for your holiday, we include a range of extras to help make your time away as enjoyable as possible. From a privilege membership card for discounted site fees to a free welcome pack with some snacks to help you on your journey, we’ve thought of everything. Find out more about our complimentary extras here. What better way to decide if the motorhoming lifestyle is right for you than trying one out for yourself? If you’re unsure about buying a motorhome take a look at our luxury hire vehicles first; we also offer great cashback options if you later decide to buy a motorhome from Leisure World. Before you take off on your big motorhome adventure we know you may have a few questions, either about our vehicles, the lifestyle or what to do if something goes wrong. We’re always happy to help and answer any questions, but first take a look at our frequently asked questions section to see if you can find the answer you’re looking for. Login to your ‘account home’ to view any holidays you currently have booked, view previous bookings or complete a hire booking. Subaru has now joined the Leisure World family! If you’re looking for a car for every occasion that is guaranteed to keep your family safe and will battle any terrain without a problem, look no further than our extensive range of Subaru vehicles. Leisure World is proud to have one of the largest displays of SsangYong vehicles in the UK. Our staff are knowledgeable about the full SsangYong range and are certain to be able to support and assist you with finding your perfect new car. Head to our Leisure World Motors website to view our stock of new and used Subaru, SsangYong and MG vehicles. You can also enquire about finance options and the range of aftersales services we offer. Find out more about the cars we have on offer by downloading one of our brochures. Don't forget, our friendly staff are always on hand to offer advice and answer any questions you may still have. Leisure World can offer finance options that give you the flexibility to pay for your car in a way that suits you. With both HP and PCP available, your next car purchase can be easier than ever. To keep your pride and joy in top condition, and to maintain your warranty, it is essential to service your caravan or motorhome regularly. Find out more about our NCC approved service centre. Convenient and high quality servicing and repairs, right where you need them. Whatever you need for your caravan or motorhome, we have 1000s of parts and spares available, so we’re sure we’ll have exactly what you need. We can carry out your warranty work at three locations across the north of England. Find out more. Convenient and safe, our caravan and motorhome storage frees up space on your drive and ensures your vehicle is secure when not in use. From caravans to coffee and awnings to advice we’ve made sure you’ll have everything you need when you visit a Leisure World branch. Time for a change? We will buy your old motorhome or caravan for cash. It’s quick, simple and stress-free. With three sites conveniently located across the north of England, you can see our extensive ranges of caravans, motorhomes and accessories at a location convenient to you. What facilities do you offer? Do you buy caravans and motorhomes? Find out more about the caravans, motorhomes, cars and accessories we have on offer. Don't forget, our friendly staff are always on hand to offer help and advice, and answer any questions you may have. Leisure World work with the best caravan and motorhome associations to ensure the highest quality possible; which is at the forefront of everything we do. We pride ourselves on great customer service and always putting our customers at the forefront of everything we do. We welcome feedback from all of our customers, as it helps us to continue improving and providing you with everything you need. Take a read below of some of the great customer feedback already received. Normal landline rate. Mobiles may be charged more. The cost of the vehicle is spread over an agreed length of time at a fixed interest rate with a fixed monthly payment. After the final payment, you own the vehicle. The cost of the vehicle is spread over an agreed length of time at a fixed interest rate with a fixed monthly payment. This simple loan calculator is designed to give an indication of the APR, monthly repayments and total repayments you could expect to pay. Due to the many factors ﬁnance lenders base their decisions upon, we cannot guarantee the ﬁgures suggested using this calculator. Please use the ﬁgures as a guide and our team will endeavour to provide the best possible payment plan based on your personal circumstances. This simple loan calculator is provided by Catterick Caravan & Camping Centre Limited, Ebor Leisure World Limited, and Tyneside Leisure World Limited, who are brokers and not lenders, and are authorised and regulated by the Financial Conduct Authority. Credit is subject to status and only available to applicants aged 18 and over resident in the UK. We work with a number of carefully selected credit providers who may be able to offer you finance for your purchase. We may receive commission or other benefits for introducing you to such lenders. The Auto-Roller range is an ideal line to approach the world of the great outdoors, to enjoy both long holidays or short breaks whether you are a family or a couple looking for comfort and convenience. Now with a saving of over £3,000, this fantastic new motorhome is included in our price smash sale, where we provide unbeatable value and promise the cheapest new motorhome deal in the UK. With six berths in total, why not take the children out with you, or embark on an epic roadtrip with friends? To the rear of this motorhome are fixed bunk beds, ideal for children. This new Elddis motorhome is fitted with Truma heating, a solar panel and benefits from sleek sport styling. More modern and advanced features can be discovered when you arrange a viewing with us at our Catterick site, either through our online form or by giving us a call. Get your great finance deal, decision today! Click here to check your credit worthiness! Leisure World have branches that are convenient wherever you live. Our sites near Catterick, York and Tyneside all have the same great choice of Leisure vehicles, and expert and friendly staff on hand to help. All of our service centres are NCC approved meaning you can rest assured of receiving the highest standards of service and care from our highly trained team of technicians. However you take your journey we can help! As well as caravans and motorhomes, we have a range of excellent cars, ideal to tow your new caravan, or tow behind your motorhome. Who wants to trek from store to store looking for caravan and motorhome accessories? At each Leisure World branch, we have everything you could possibly need all under one roof. When you order from our online awning and accessory stores, we’ll deliver to you within two working days. Alternatively, if you prefer your order can be delivered to your nearest branch, ready for you to collect at your convenience. Please select a video from below. We would like to send you occasional newsletters regarding new products and events via email - Your details are secure and will not be distributed to 3rd parties. Catterick Caravans Leisure World and Leisure World Motors are trading names of Catterick Caravan and Camping Centre Limited. Registered no. 6004556. Ebor Leisure World Group Limited. Registered no. 7915090. Tyneside Leisure World Group Limited. Registered no. 7915051. Catterick Caravan & Camping Centre Limited, Ebor Leisure World Group Limited, Tyneside Leisure World Group Limited, are the trading subsidiaries of Leisure World Group Limited. Registered no. 7914581. All companies are registered in England and Wales. Registered Office for all companies: Catterick Bridge, Richmond. Yorkshire. DL10 7JB. Group VAT no. GB 123 4040 67. All calls are recorded for training and quality purposes. *Finance is subject to terms & conditions, and dependent on your status. **Please note prices displayed are rounded down to the nearest full pound. For exact prices please select your holiday dates on the vehicle page.